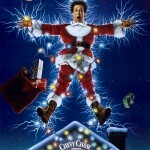 In National Lampoon’s Christmas Vacation, released on December 1, 1989, mistake-prone patriarch Clark W. Griswold throws caution (and previous family disasters aside) and embarks on a brand new adventure – hosting the best Christmas that he and his family have ever had. The third installment of the Griswold series, in my opinion rivals the initial National Lampoon’s Vacation as the best of the bunch. The Griswolds remind us that even throughout all the insanity of the season, it’s family that makes it memorable. 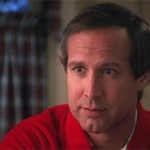 This is Chevy Chase doing what he does best . . . being laughable and laudable at the exact same time. As “Clark,” his heart proves to be even bigger than his aspirations, and when those aspirations include decorating his house with “250 strands of lights, 100 individual bulbs per strand, for a grand total of 25,000 imported Italian twinkle lights,” that’s a BIG heart! 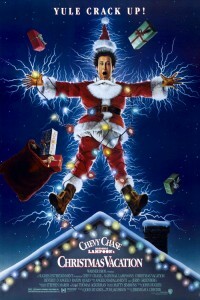 Personally, this movie is my favorite Christmas movie of all time, just beating out A Christmas Story (and Die Hard…). 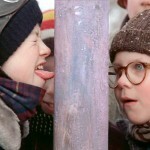 There’s something inspiring about watching a movie where despite an obscene amount of obstacles, Christmas can still go on. Even when a home is ravaged by both a squirrel and a SWAT team, nothing can take the spirit out of a loving family. Christmas Vacation isn’t a Miracle on 34th Street or It’s a Wonderful Life type of film. You probably won’t find yourself tearing up from any heartfelt speeches or overly sentimental moments. 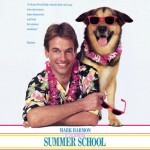 It is, however, still a feel good family movie that everyone can watch and enjoy. Everyone has their very own “Cousin Eddie” in their life, or can relate to wanting to kidnap their boss due to not getting a Christmas bonus. Who hasn’t wanted to tell their snobby neighbors where they can stick a Christmas tree? The Griswolds prevail despite their problems by staying together and not succumbing to disaster. So watch it over and over this holiday season with your family, friends and anyone else who needs to laugh. 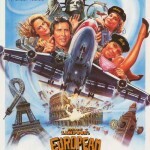 Just don’t go picking up the sequel. . . . It’s actually worse than European Vacation . . . and that’s hard to do. So here’s wishing you the hap, hap, happiest Christmas since Bing Crosby tap-danced with Danny f#$%!ing Kaye!